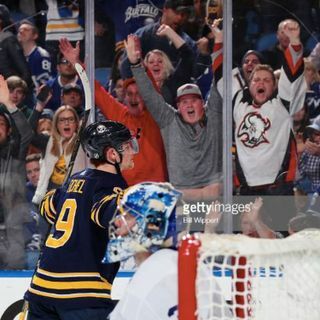 Joe Yerdon joins the show to discuss the Sabres unexpectedly successful start to the season (1:00), The Tim Murray Years with the benefit of hindsight (16:10), the deadly combination of Jack Eichel and Jeff Skinner (29:00), Rasmus Dahlin's immediate brilliance (41:40), and the big decisions that wait ahead (49:45). Sponsoring today’s show is SeatGeek, which is making it easier than ever before to buy and sell sports and concert tickets. They’re giving our listeners a $10 rebate off of ... Más informaciones their first purchase. All you have to do is download the free SeatGeek app and enter the promo code PDO to get started. Also sponsoring today’s show is PuckPedia. It’s the ultimate resource for hockey fans, containing salary cap information, basic and advanced stats, draft and transaction history, news feeds, game previews, and injury updates. It’s also the exclusive home of the Agent Leaderboard, which shows who the top agents are and lists which players they represent. Regardless of what you’re looking for, it’s got it, which means that you no longer need to be switching between multiple different sites in the pursuit of information.